Tell us a little bit about your company – what is your business in your own words and how did the idea for the business come about? Our idea was pretty innovative at the time; the whole reason we started our business was because nobody was in our space, and it all started from a pretty personal place too! 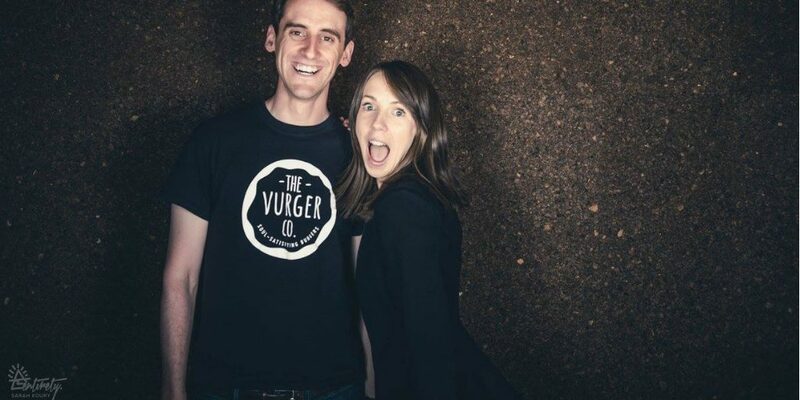 Neil, The Vurger Co co-founder, had actually suffered from a debilitating stomach illness for around 10 years. Having had so many tests, a series of different medications and so many appointments it got to the point where he was advised to have an operation. We sat thinking, ‘well, nobody is sure exactly what they are operating on’ and that was the point we decided to take it in our own hands and do a little research ourselves. It coincided with a big birthday and after taking a trip to California. We couldn’t believe how well you can eat plant-based foods without any labels or stigma attached – amazing flavours, texture and people who were using veggies in innovative ways. We felt better than ever and returned to London figuring out how to adopt this lifestyle in the UK and we haven’t looked back. When we returned to London, we had crazy busy jobs and started looking for a place to eat a plant-based burger casually – in a nice environment, just to chill out after work together – and we couldn’t quite find what we were looking for. There were many veggie options in the market, however, we got sick of asking, ‘please remove the cheese, and the egg-based mayo, oh and the patty with egg…’. Nobody understood in London what vegan was. We felt ostracised for eating this way and in such a progressive city. We couldn’t understand why Londoners who chose to eat this way couldn’t find a lovely environment to feel at home in. Was there a ‘lightbulb moment’? It was a lightbulb moment – we thought if we’re looking for a restaurant like this, we guarantee others are too! This was all in June 2016 and set the wheels in motion to start our business The Vurger Co! There is definitely no typical day in this industry – every day is a new challenge! Often our days start with a visit to the production site, this is where we make all of our patties and sauces from scratch and fresh salad prep. We check in to see how they are, what they need, discuss any issues and talk about the sales the day before. We then help pack for the daily order to both sites, Shoreditch and Canary Wharf, and we often deliver to one of the sites ourselves to then check in with the team there. Our newest site is Canary Wharf so we have been heavily involved in the day to day training, trouble-shooting and processes/procedures. It takes a lot – and we mean a lot of time – to ensure everybody in your team is up to scratch to deal with the heavy volumes during busy spells. Every single team member has to understand every part of the section they work within. So, for example, we ensure the kitchen team work on all aspects behind the scenes, in order to move around seamlessly if there were to ever be a staff shortage or sickness. Then we would travel to Shoreditch and carry out the same catch up with the team there. Collaborations are a huge part of our business, so we work with our Executive Chef Gaz Oakley, to develop new dishes, think ahead of the curve and be innovative with fresh vegetables and ingredients. We carve out a couple of days a month to go over this or through some ideas and then shoot the burger. Every day we make time to ensure we’re looking at ways of bettering our systems and procedures. This business has SO many moving parts that we have to ensure everything is running smoothly. Keeping on top of marketing our business, ensuring we take care of our teams’ well-being and nurturing their growth, looking for ways to collaborate with others, ways of bettering our business and ensuring we’re sticking to our overall goals for the year. Were there any big ‘pain points’ when you were starting up the business? There were and continue to be a lot of pain points! These were our top three pain points for sure! And the high point so far? Have there been any low points, and how did you overcome them? The lowest point we had was actually losing the first property that we were almost about to sign in Victoria – after all the hard work and plans we put into, it was pretty demoralising. At the time, we didn’t know a lot about Westminster Council and their plans for reducing delivery in the area in certain boroughs. Then our solicitor thankfully found this clause which made it completely unfeasible for our business. So, we definitely learnt a lot going through that process, as it set us back around four months and we had to start our property search again from scratch! Have you had any support along the way, or is there anything you’ve found useful? We definitely wouldn’t be here without the support we’ve had along the way. We’ve had support from our amazing friends and family on a personal level. Some of our investors remain seriously close to our business as some of our biggest champions, some amazing chefs including our current Executive Chef Gaz Oakley, operations experts and also one person in particular who’s really been there and worked in this space for years – who has gone on to create another insane company! It’s important when you’re starting out to not close yourself off from all of the amazing people who can help, even if you think it’s the smallest question or the most stupid thing you could ever think of. Trust me, it can transform your business! You’re doing something that really means something to you, so everything you do every day is done with purpose and passion. Ultimately you’re creating your own little stamp on the world in your own way, which is what gets you out of bed in the morning. You also get to see your customers enjoy your space and product, you get to see your team grow, make insanely good friends and impact so many lives with your hard work. That is pretty priceless. Has your life changed since starting your own business? MASSIVELY! We worked hard before, however, we literally live and breathe our business – it DOES NOT STOP! If anyone is thinking about starting a food business, be prepared for long, long, long, long, long hours. However, we’re building something that we’re very, very proud of, so sometimes it just doesn’t feel like work. You don’t get that Sunday afternoon dread, or the Monday morning slog, there is just NO time. So every day we hit with a plan, every day we have an agenda. Every day is nonstop, which is just the way we love it! What advice would you give to someone thinking of starting up a business? Be prepared for an incredible level of work, and we don’t just say it for effect – we have cancelled holidays, missed family birthdays, forgot about family trips, had multiple all-nighters – the list goes on. Don’t think it will be a walk in the park because you’re different in some way! Congratulations on the success so far, and well done for opening a second venue in Canary Wharf! How have you found opening the second place compared to the first? Thank you so much! Some aspects of opening a second site are a little easier because we’ve already done it once, so we know what works and what we got wrong the first time. For example: finding the right property, planning the kitchen space, thinking about displays and how it feels for the customer, construction and legal work. However, this is the only time you will double the size of your business in one go – so that means production, purchasing, staffing. That side of things has been the most challenging. Are there any plans in the future to expand further? Vegan restaurants have become very popular in the last few years or so – even big names are including more vegan-friendly options on their menu’s. How do you hope to see vegan cuisine evolve in the future? You’re absolutely right, it’s an exciting space to work in at the moment! Obviously, this is a good thing that big brands are FINALLY taking notice of the vegan movement as it spreads the message, helps to normalise vegan food and it inevitably gets more attention to our business as more people are looking for vegan options in general. However, there is a flip side! They tend to take all the press attention because of their marketing budgets, which is very frustrating for smaller brands like ours. We have seen two vegan brands close just in the last few weeks – so the wider community do need to always remember to support small vegan businesses too! We hope vegan cuisine continues to become a fully mainstream option for people, without labels attached. We would love to read one day, ‘That was just a great “[insert cuisine]” restaurant, not a great vegan “[insert cuisine]” restaurant’. This needs to happen! What’s the one thing you wish you knew in the beginning? Don’t trust everyone you meet and be open to advice, but you should always make the final decision because only then can you be happy with the course of your business and what you’ve done. Would you say there are any particular qualities needed to run your own business? What do you like to do in your spare time – what helps you to wind down? This question probably isn’t the best for us, as we literally just cancelled a holiday at Christmas because we couldn’t leave the business, haha! So we’ll just say Netflix at any time we can to help switch our brain off before bedtime. A big thank you to Rachel and Neil for taking time out from preparing tasty burgers (and the much-loved vegan mac and cheese) that is already changing the perception of plant-based food, to chat with us. Want to know where you can find The Vurger Co goodness? Visit their website and Instagram – @thevurgerco – to see for yourself! If Rachel and Neil’s #StartUpStory has inspired you to delve into the world of business, take a look at our company formation packages here.